…but I will not forget you. "He who saves one Jewish life is considered as if he had saved an entire world'." This concept imbues ahavat yisrael (love of one's fellow) with an urgency, a vitality. To the shliach, each human being is an infinity, the spark is there, and nothing in the entire world is more important. Perhaps most revealing of this outlook is the response to those whose cries are the faintest, the constituencies without advocates the elderly, the sick, the vulnerable, the imprisoned, the addict, the remote communities. In a word, the forgotten. Discussing Judaism in Montevideo, Uruguay. The small, isolated communities, without access to Jewish resources these are a major concern. Initial contact is often made through the Student Visitation Programs. Rabbinical students voluntarily give up their personal vacations to travel from place to place, meeting, giving classes, disseminating Jewish publications ...planting seeds of Judaism. In today's modern society, with its highly developed social conscience, one would be justified in believing that all the needs of the Jewish people throughout the world are taken care of. Sadly, this is not always true. 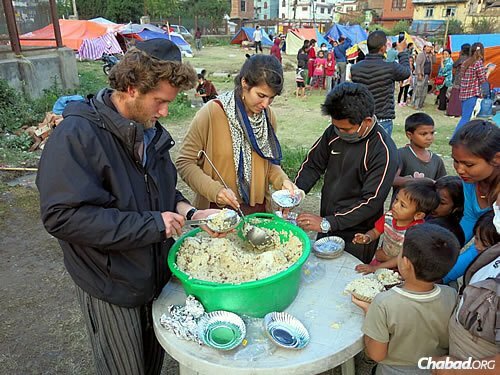 Chabad Lubavitch worldwide is organized to reach out and help the hungry and the needy among us. For it has always been the Chabad tradition never to turn away a person in need. Outstanding in the field of social service and rehabilitation is the Chabad centers and Jewish Community Centers in the Former Soviet Union. The missionaries and cults have found many of our young people vulnerable targets. The response is vigorous and forceful, filling the void with a knowledgeable pride in our heritage. Throughout the world, it is to Lubavitch that distraught parents turn for help in bringing their children home. As the opioid epidemic accelerates, Jewish families have turned to Project HEART, which works to provide for the Jewish needs of teenagers in treatment centers and as part of wilderness therapy programs. 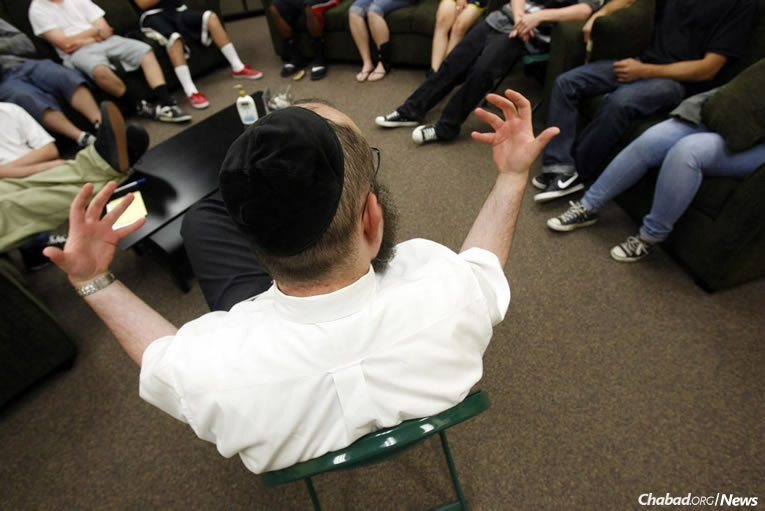 Above: Benny Zippel, co-director of Chabad Lubavitch of Utah in Salt Lake City, counsels a group of teens. Chabad National Drug Abuse Treatment Programs: Once upon a time, Jewish men and women did not get addicted to drugs. Or if one did, certainly no one talked about it. Times have changed. Over the course of the last decade the upward spiral of drug use and abuse has taken root and begun to spread in the Jewish community. Each year more and more men and women within the Jewish community identify themselves as drug dependent, and seek treatment. But for those that desire professional, clinical care in a Jewish environment, there is but one place to turn the Chabad National Drug Abuse Treatment Programs, operated under the auspices of Chabad Lubavitch of the West Coast. 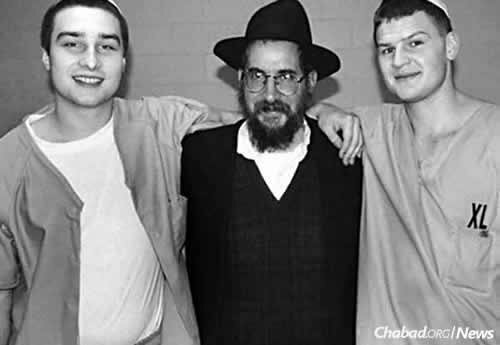 Rabbi Binyomin Scheiman, who has been visiting prisons since 1980, with two young incarcerated men. Finally, those most isolated and forgotten of all the prisoners. In State and Federal penitentiaries, in prisons in countries throughout the world, Jewish inmates know that Chabad remembers them and cares, and helps. The Alef Institute, headquartered in Miami, Florida, coordinates visitation, religious services and publication for Jewish prisoners throughout the U.S. Walking through the rain for miles to conduct a Seder in a jail, taking hours out of a busy day just to talk to a despairing prisoner, bringing a message of hope and dignity.